Fixed Arm Roller Cone Hole Openers with Replaceable Cutters – Mills Machine Company Inc.
Mills Machine Company has been a manufacturing fabricated cutter (split bit) hole openers for over 60 years. 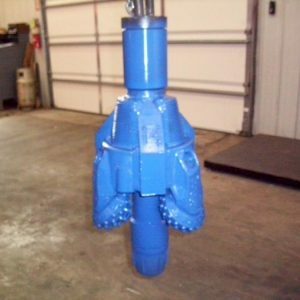 In 1994 we started working with some companies in Louisiana to secure prints and specifications to build oil field type hole openers with demountable roller cones. These hole openers are manufactured from a solid piece of 4142 heat-treated alloy steel and the arms are fabricated into the body. The roller cones are held in place by sliding the cutter journal into a cam lock slot and then a load pin is inserted through the journal to hold the cutter in place. These rugged Hole openers feature cutters that are interchangeable with one of the most popular name brand Oil Field Hole Opener Manufacturers. Fixed Arm roller cone hole openers range in size from 10 5/8″ to 26″ diameter. We offer open or sealed bearing construction with Steel Teeth or TCI Buttons in soft, medium, and hard formations. The bit is available in a Single or Double Stage design depending on the pilot hole and enlarged hole size. 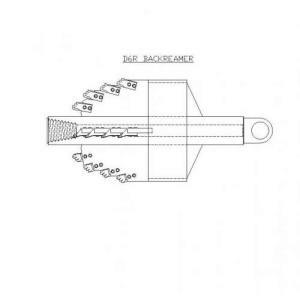 The Holeopeners are available with either 3 or 6 jets. We are one of the very few manufacturers that have ever made a Two-Stage Hole Opener in this design. The cutters are field-replaceable and can be disassembled to replace the bearings and seals. Steel tooth cutters can be retipped to extend the life of the cutter. The top connection includes breakout flats or extended fishing neck. The bottom connection will be made to fit your pilot bit. We can also, furnish a bull nose to guide the hole opener.